The voice of academic-related professional staff in UCU. The academic-related, professional staff (ARPS) committee has responsibility to advise and make recommendations to the national executive committee on any issues arising specifically from or related to the employment of members in academic-related roles. The committee meets three times a year and is also responsible for the organisation of the academic-related staff national annual meeting. The ARPS committee is a special employment interest committee constituted under UCU rule 24.1. The committee produced materials that can be used in branches to attract and recruit academic related, professional staff members working in universities. Branches can select the most relevant poster and request printed copies by contacting Martin Whelton in the campaigns team. Jenny Lennox is secretary to the committee and the national official with responsibility for academic-related members. 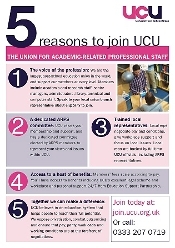 The term 'academic-related staff' covers a wide range of roles in higher education; information services, computing, support and administration in grades represented by UCU.